The Corfield company started just after WWII by two brothers as a small family company, initially in their own home in Wolverhampton! Their first product was an exposure meter for photographic enlargers, the Lumimeter, followed by several other accessories. 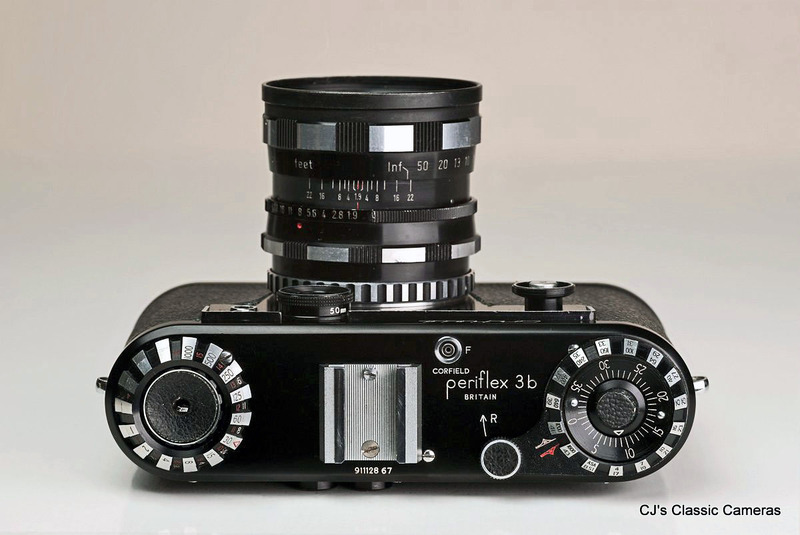 The success of these and the talent of the Corfield brothers for design and marketing let to the development of their first camera, the 35mm Periflex with Leica screw mount. This compatibility with the Leica was a genius move as it allowed people to use the many accessories that were made for that system and were easily available. 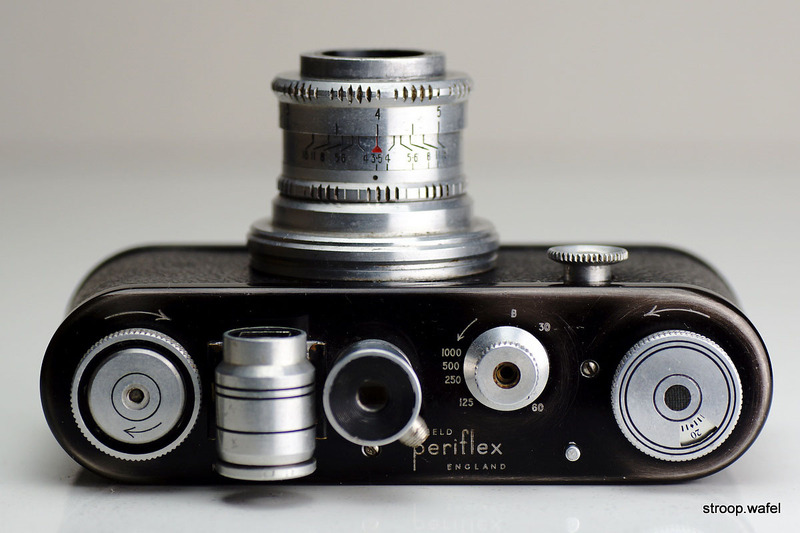 As the name indicated, the original Periflex camera had a unique design feature: a small periscope that could be lowered in-between the focal plane shutter and the lens, and was used to focus the image. Unlike a true SLR, however, the image still needed to be composed using an additional viewfinder. Corfield also produced a 50mm lens, the Lumar, in collaboration with the British Optical Lens Co. As lens and body were made of aluminium, the camera was surprisingly light for its size. 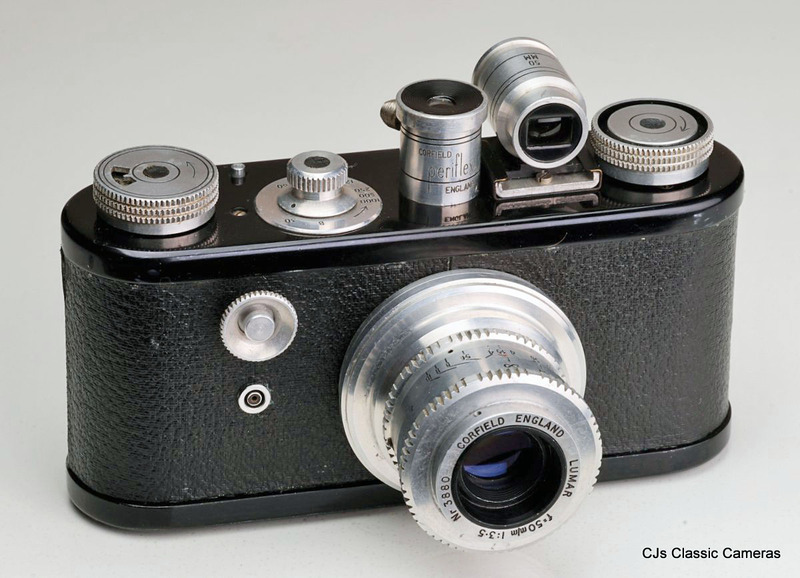 The build quality was not quite up to the Leica standard but it was a very capable and successful camera indeed. 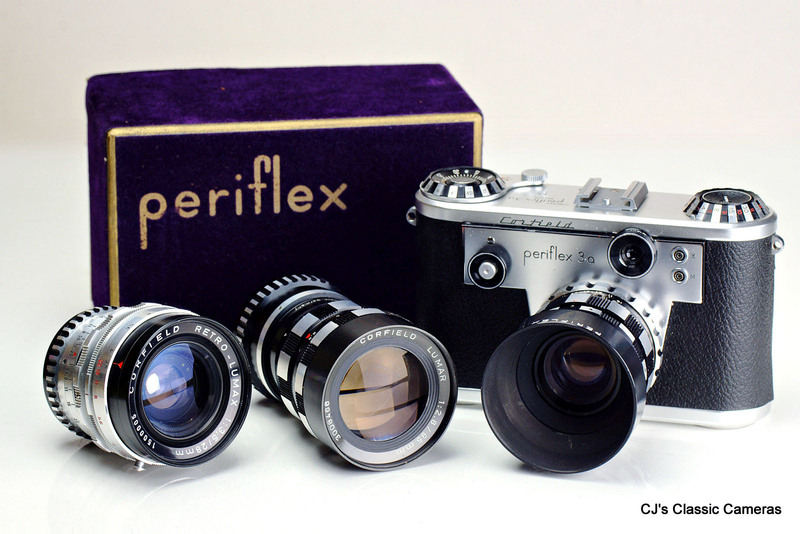 Very first version of the Periflex in black enamel with pigskin cover and Lumar 50mm f/3.5 lens, shown here with its rather plain original box. The pigskin cover stained easily and therefore Corfield soon decided to use black leather instead. Top view of the pigskin Periflex. There's a few features that characterise this very first version of the Periflex, including a double arrow on the speed dial as well as small markers indicating the speeds. On later production these markers were no longer present, and the double arrow was replaced by a single one. As said, early produciton of the Periflex was covered in orange brown pigskin. The story goes that on many early Periflex bodies the original pigskin cover was replaced by black leather, but I don't think this practice was actually all that common. All pigskin Periflex examples I have seen have consecutive serial numbers (from 1971 up to 2434), uninterrupted by black leather ones. Also, I have seen very few black leather Periflex with characteristic features of the earliest Periflex production (i.e., two arrows pointing in opposite directions on the speed dial, small markers next to the shutter speed numbers). Of course, there is no doubt that some black leather Periflex with low serial numbers (up to about 2500) may have started their lives with pigskin covers, but I don't think there were that many. Another point of contention is how many pigskin Periflex were made. Based on serial#, certainly not much more than 500. However, the Lumar lenses have a similar range of serial# and if these were unique numbers (i.e., no overlap with body numbers), the total may have been only half that. I have found little information in support of one or the other option. The second version of the black Periflex had black leather in stead of pigskin, and is shown here with its matching Lumar 50mm f/3.5 lens. Note the flash sync, which had a small ring around it that was not yet present on the pigskin version. There were also a few small differences in the shutter speed indicators (see top view below). Top view of the black Periflex. By looking down the small eye piece of the periscope finder with the periscope pushed down, one would see an enlarged image of the subject on the focussing screen, allowing the lens to be properly focussed. Note the single arrow on the shutter speed dial as well as the lack of marks next to the speed indicators, both different from the earliest pigskin Periflex shown earlier. Late production of second version of the Periflex I. 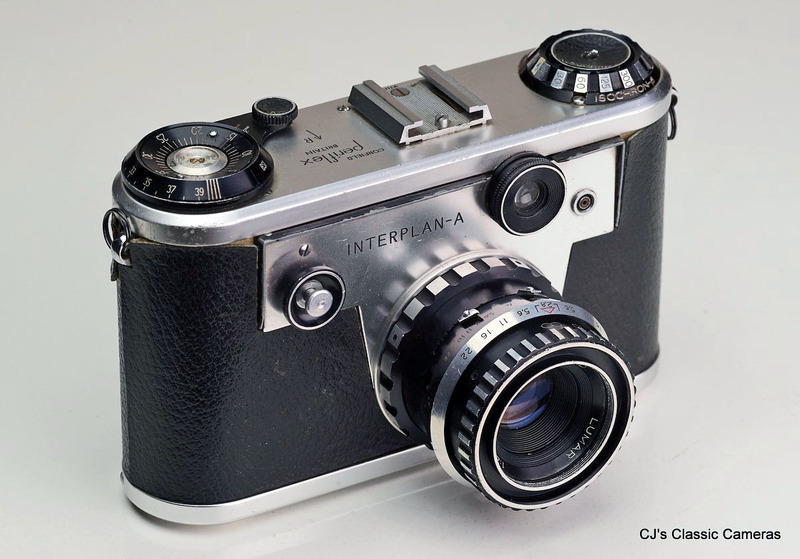 This version had an aluminium disk benath the shutter release button, on which the shutter speeds were engraved. It was the same as on the later chrome version of the Periflex I. 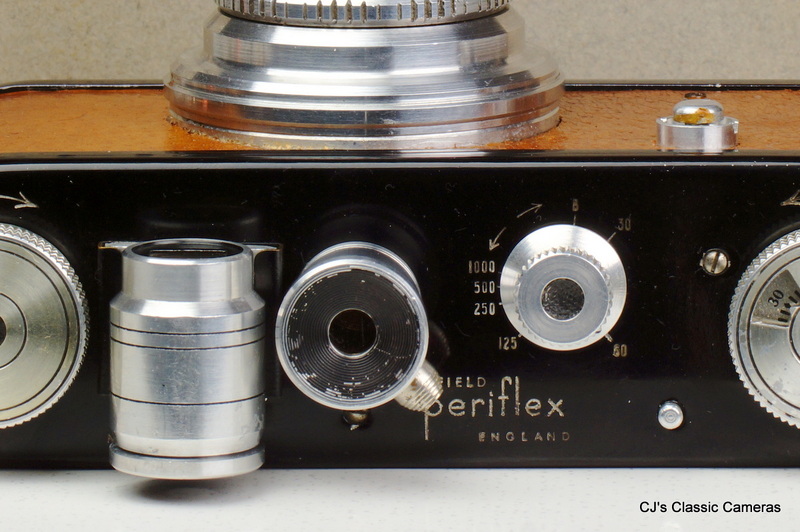 In addition, the name 'Corfield Periflex England' was engraved on the periscope and no longer on the top housing itself. Again, this was similar to the later chrome model. Also on this model Corfield started to put body# inside the body instead of under the viewfinder. This version is much rarer than the original black leather version of the black Periflex I, and not wel documented anywhere. I thought initally that these were fake painted version of the chrome Periflex I, but the serial# precede those of the chrome ones I have seen, so it appears a genuinely different model, transitional between the original black and later chrome Periflex I. 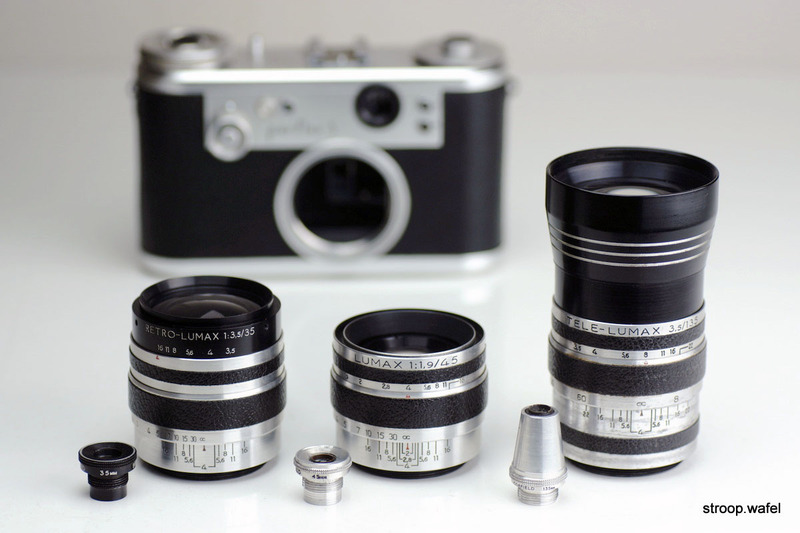 It appears these were still sold with the original Lumar 50mm f/3.5 lens. The benefit of the periscope focusing aid was that any lens that could be mounted onto the camera could be used and properly focussed. As the Corfield lenses had no rangefinder coupling, the reverse was not true, when using these lenses on other Leica screw mount cameras one will have to rely on the distance markings on the lens. Camera handling was a little slower than most Leica copies. Winding the camera required two actions: the film was forwarded with the wind knob, then the shutter was cocked separately by turning the shutter speed knob. Similarly, focussing and framing the shot were done separately with the periscope and viewfinder, respectively, which required a change in position of the camera, as one would look down through the periscope, whereas the viewfinder was of course horizontal. Last variant of the Corfield Periflex I with chrome top and bottom plates. It has the matching Lumar-X lens mounted, which had the same optical formula but a redesigned lens barrel compared to the Lumar lens on the earlier black Periflex models. Top view of the chrome coloured version of the first Periflex. One of the great things about the Periflex was its ability to use, and properly focus, lenses lacking rangefinder coupling. For instance, one could mount many non-native lenses by use of a L39 adapter. 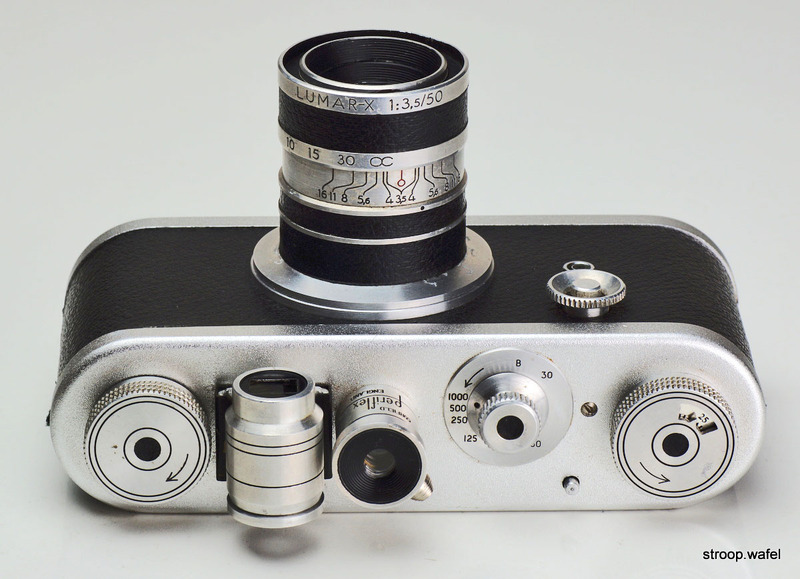 Another great little lens was the Industar-69 28mm f/2.8 pancake lens. It had a 39mm screw mount but since it was made for the Chaika (a half frame camera with slightly longer register distance than the Leica screw mount), it needed a little work to be made to focus to infinity. In essence, the focussing thread inside the lens needed to be ground down by about a millimetre, but it was well worth the effort. It vignettes quite strongly but one has to keep in mind it was designed as a half-frame lens. Now I just need to find a proper 28mm viewfinder, as ironically, the multi-viewfinder which is mounted on the Periflex sticks out more than the very flat Industar lens! 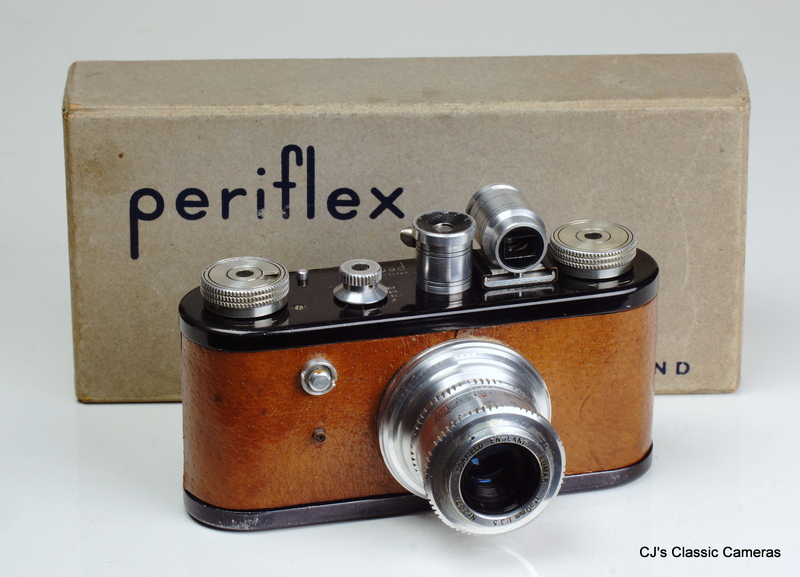 In 1957 the Periflex was nearly completely redesigned and made much more user-friendly. The periscope would automatically lower when the film was advanced and lift again when the shutter was fired. The top housing was enlarged and now contained both the periscope and viewfinder windows. The camera had therefore two eyepieces at the back, so it was much easier to focus and frame the shot than with the Periflex I. In fact, there was a third eyepiece through which one could see the film speed setting, which was adjustable by means of a small dial at the front. It is a little unclear to me what the benefit is of this setup compared to a somewhere on the body of the camera. The viewfinder showed frame lines for two focus distances, infinity and another one marked Fx15 for portrait distance, F being the focal length of the lens mounted to accommodate differences in parallax. The new model had an interesting method of adjusting for different focal lengths. The viewfinder had an interchangeable front element that could be exchanged when necessary for use with different focal lengths. This was a little cumbersome as not only did one have to unscrew one lens and mount another, one had to repeat this procedure for the viewfinder. The shutter speed dial (located beneath the rewind knob) featured an extra set of numbers which indicated the Light Value for a range of different apertures, to aid the use of external light meters. The new Periflex model was called the Periflex 3 and a year later, a less well-featured version, the Periflex 2, was introduced (see below). Corfield Periflex 3 with fast Lumax 45mm f/1.9 lens. This six-element lens breached a patent by Wray, which got Corfield into trouble (see more on that below with the Interplan-A). Note the large speed dial on the right side of the camera, which also hosted the rewind knob. Other lenses introduced roughly around the same time were the wide-angle 35mm f/3.5 Retro-Lumax (on the left) and the 135mm f/3.5 Tele-Lumax (on the right). A slower 100m f/4 was also available. Each lens came with its own dedicated viewfinder that, like the lens, needed to be screwed into the front of the camera. A year later, a less well-featured version of the Periflex 3 was introduced, the Periflex 2. It had a non-interchangeable viewfinder without any frame lines, a slower top shutter speed of 1/500s, and had no film speed window. It still had an interchangeable lens mount, so one needed to get separate accessory-shoe mounted viewfinders if one wanted to use a lens of a different focal length. Not much of a throwback compared to the system on the Periflex 3 really. The camera was of course cheaper than its more advanced cousin, and the story goes that it was introduced only a year after to avoid eating too much into the sales of the Periflex 3. A Corfield Periflex 2 with Lumax 45mm f/2.8 lens. 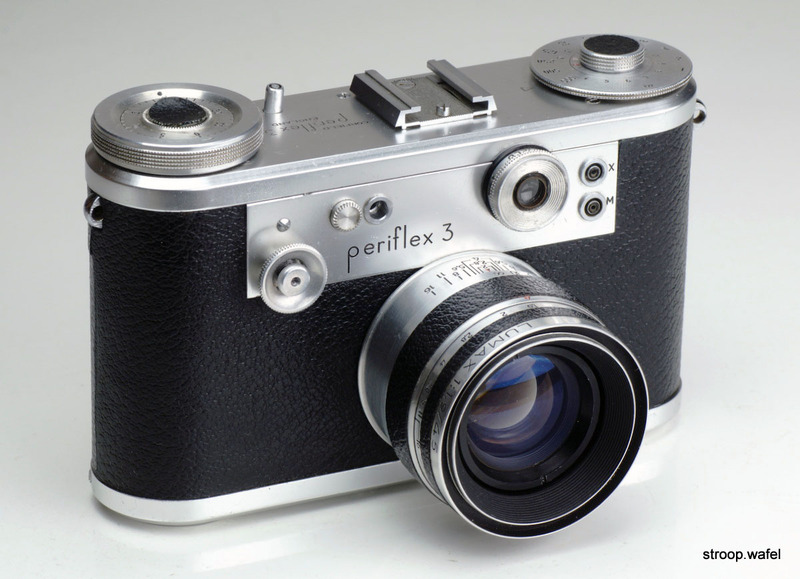 In 1959 the Corfield factory moved to Northern Ireland and not long after an updated version of the Periflex 3, the Periflex 3a, was introduced. Most changes were cosmetic and the general layout of the camera remained the same. The main improvements were the introduced of a lever wind instead of a wind knob, and the periscope, which now featured a small split-image rangefinder, which allowed for more accurate focussing. 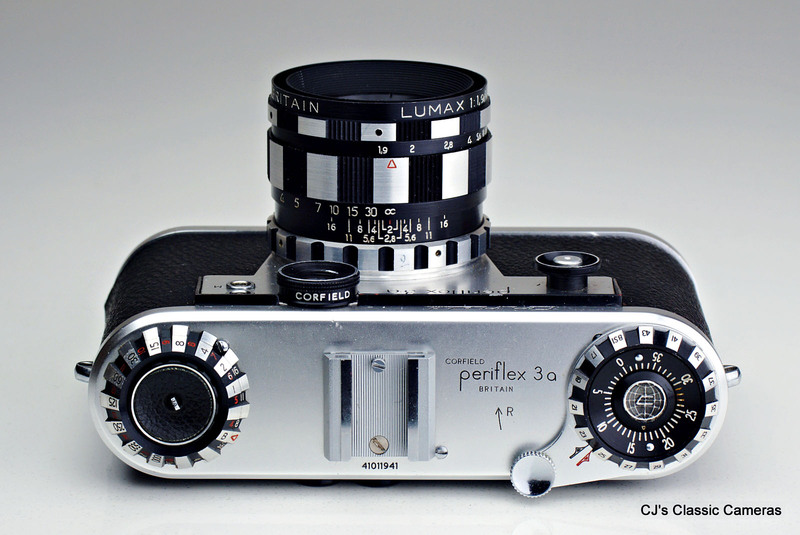 The frame counter (integrated with the wind lever) now also featured a film speed dial, doing away with the extra viewfinder and adjustment dial present on the Periflex 3. The cosmetic changes were most noticeable for the lenses, which were now made in black with grey stripes, in line with the popular 'zebra style' at the time. 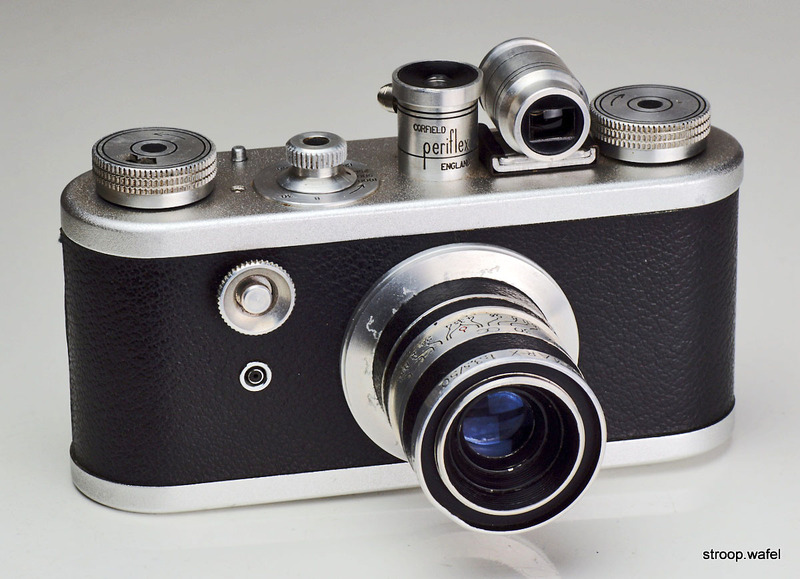 The wind knobs of the camera where fashioned in a similar style and the interchangeable viewfinder front cells were now made in black. Corfield Periflex 3a with Lumax 45mm f/1.9 lens, an updated version of the same lens as seen on the Periflex 3 above. Corfield Periflex 3a with Lumar 95mm f/2.8 telelens and Retro-Lumax 28mm f/3.5 wide-angle lens. The latter is a very rare lens and in fact identical to the six-element Enna Ultra-Lithagon 28mm which was available in m42 and Exakta mounts. Corfield probably ordered these specialty lenses in small batches based on demand; they were easy to adapt to the m39 mount by Enna by simply adding an m39 flange, as no rangefinder coupling was needed with the Periflex system. Another example was the 85mm f/1.5 Super-Lumax, which was equivalent to the Enna Ennaston (later Lithagon) 85mm f/1.5. I've only seen a few of the Retro-Lumax 28mm, they all have serial# close to 1,500,000 (the one shown here has 1,500,005) suggesting very limited numbers. It was also available in the original polished alloy mount, which is equally rare or even rarer. Although apparently 28mm viewfinders were also available I have never seen one. The three-element 95mm Lumar also has an Enna equivalent (Ennalyt 95/2.8) and is a little more common than the 28mm Retro-Lumax. It replaced the slower 100mm f/4 lens. Comparison of top plates of the Periflex 2 and Periflex 3a. 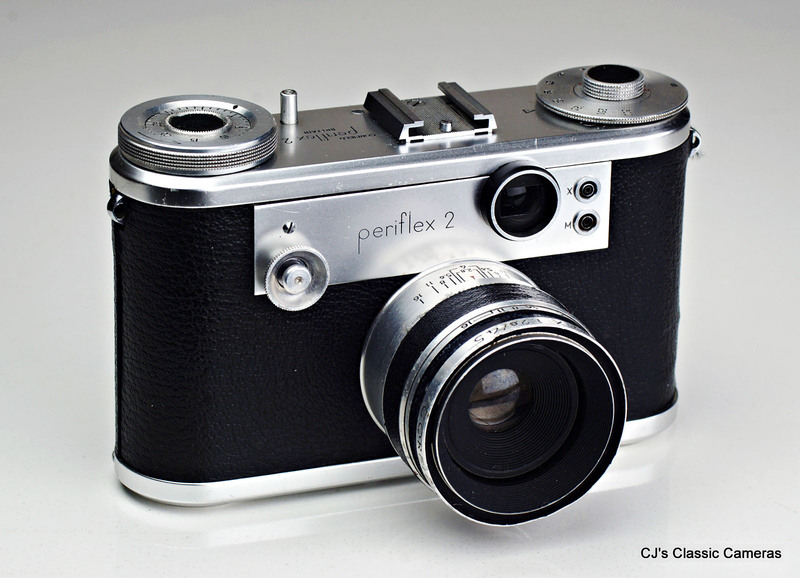 A few years after the introduction of the Periflex 3a, in 1961, the Periflex 2 was also updated. This version was called the Gold Star, not 2a as one might have expected. Perhaps this was because the Gold Star was better featured than the Periflex 2 and in fact very similar to the Periflex 3a, the main difference being only its lack of the fastest shutter speeds. The Gold Star was a very successful model and probably the Periflex that is most easy to get nowadays. Corfield Periflex Gold Star with Lumax 50mm f/2.4 lens, the standard lens for this model. Introduced around the same time was the 135mm f/2.8 Tele-Lumar lens, the fast aperture belying its comparatively small size. The patent associated with this five-element telephoto lens, which was made by Enna-Werk in Munich, Germany, can be found here. Close-up of the periscope lowered into the body. Upon pushing the shutter release, the periscope would shoot upwards out of the way and would then trigger the focal plane shutter. If more accuracy was needed an extra accessory was available, the focusing screen adapter. One would mount this adapter on the lens, with the latter secured by a clamp and a tripod, and the ground glass would show the exact focus and frame size. Afterwards one would replace the adapter with the camera body. This accessory is also very handy for testing Leica screw mount lenses. 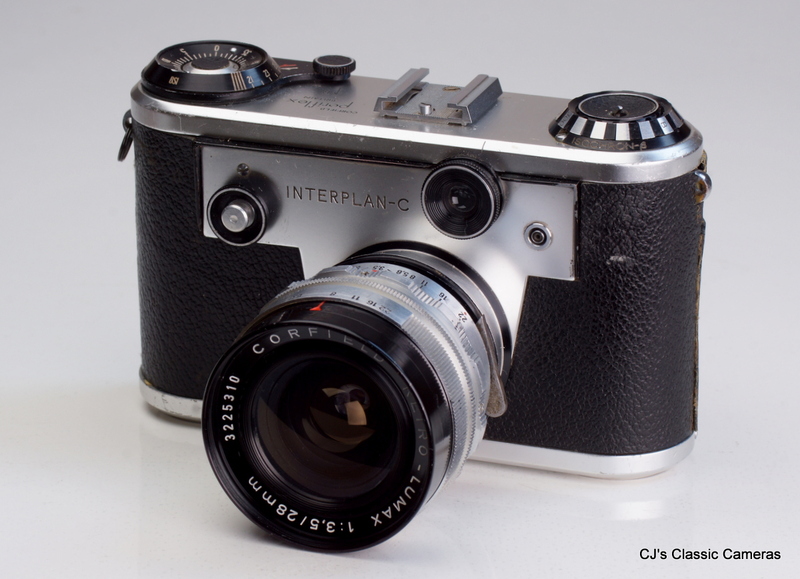 Corfield went on to make several more versions of the Periflex called the Interplan, including versions for LTM (Interplan-A), m42 (Interplan-B) and Exakta (Interplan-C) lens mounts. The latter two simply had fixed LTM adapters mounted on the body. 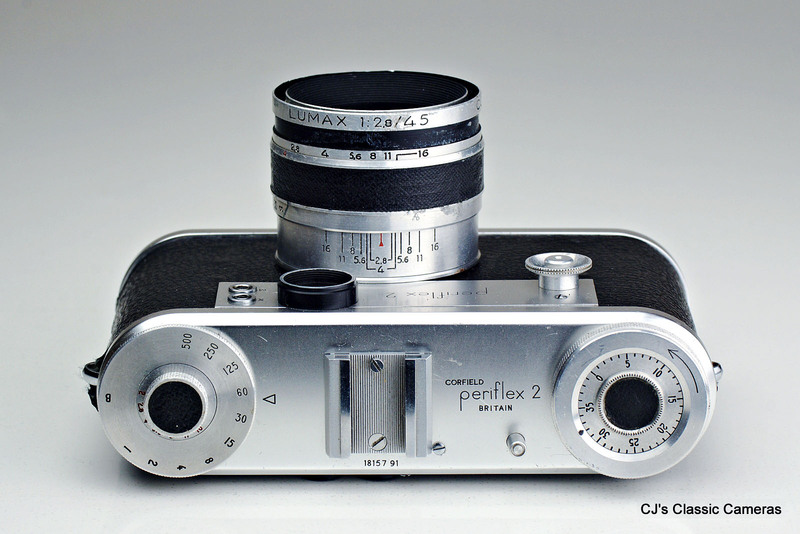 The Interplan lacked the periscope viewfinder, but the name Periflex was still used on the cameras nonetheless. They had a fastest shutter speed of 1/300 compared to 1/1000 on the Periflex 3a. Corfield Periflex Interplan-A with Lumax 50mm f/1.9 lens, introduced around the same time as the Lumax 50mm f/2.4 lens on the Goldstar above. The lenses looked very similar, in fact the bodies appear identical. They were both made in Germany by Enna-Werk, but the f1/.9 lens had the marking 'Lic'd by Wray'. It also shows patent nr. 575076 which can be found here. It was a 1944 patent for a five-element version of the double Gauss lenses such as the Zeiss Biotar and Schneider Xenon by removing the rear element and separating and bending the rear doublet. It appears that the earlier version of the f/1.9 Lumax infringed the patent by Wray, even though it was a six-element lens, after which Corfield were forced to add the patent info to the lens and presumably pay a license fee. 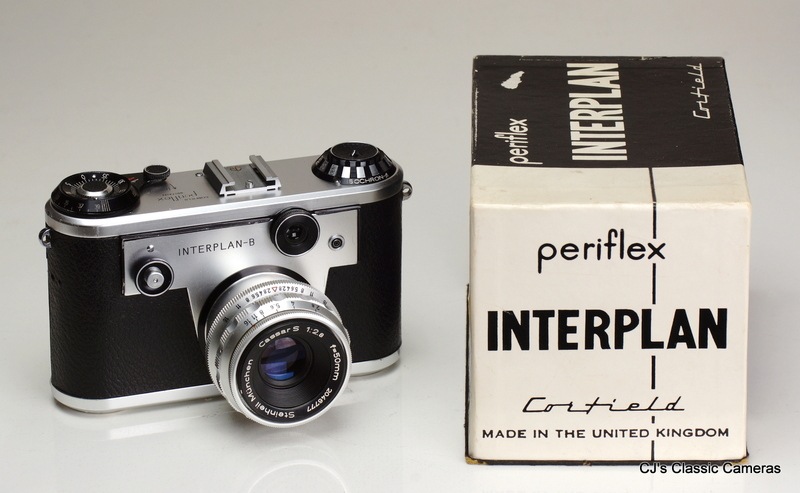 Corfield Periflex Interplan-B with Steinheil Cassar 50mm f/2.8 lens, shown with its original box. The camera also came with a manual, which was essentially a leaflet stapled around a Periflex IIIa manual with a warning that the periscope focussing did not apply (!). This camera had a M42 mount (also known as Praktica or Pentax mount). There were a few Corfield branded lens available for it (made by Enna Munchen) but that sort of defeats the point, I suppose one would buy this camera if one already had some M42 lenses. To be honest, I sort of miss the point of this camera; if one wanted to use M42 lenses one could simply use an M42-LTM adapter on an Interplan-A. But I suppose that if you knew you were going to use M42 lenses only, a fixed mount would be the more reliable choice. 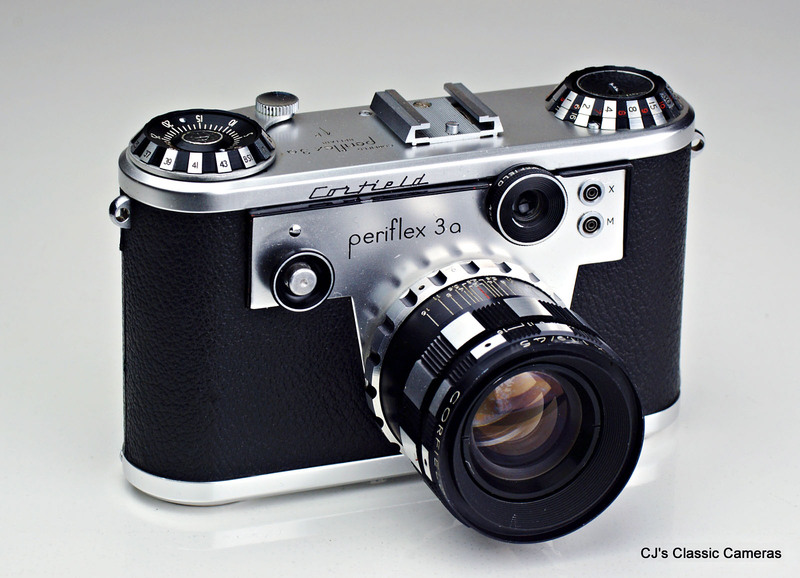 Corfield Periflex Interplan-C with Corfield Retro-Lumax 28mm f/3.5 lens (made by Enna Munchen) in Exakta mount. Other than the mount, the Retro-Lumax is the same as the one shown above with the Periflex 3a. However, the serial# fall in different ranges. Rather curiously, the focal length of the viewfinder mounted on this example is indicated as '58 mm', an unusual number that I have not seen on any other Periflex before. Clearly, this example was meant to be used with the Carl Zeiss Biotar 58mm f/2, a popular lens for the Exakta Varex (I have one here). 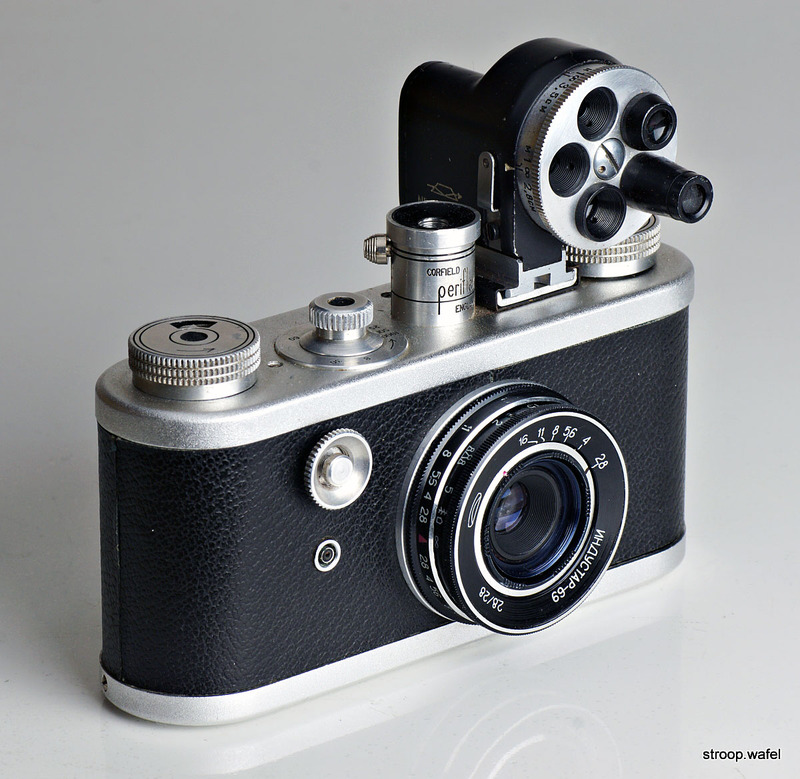 Note that a 28mm viewfindr does exist, I recently obtained a chrome-coloured version. 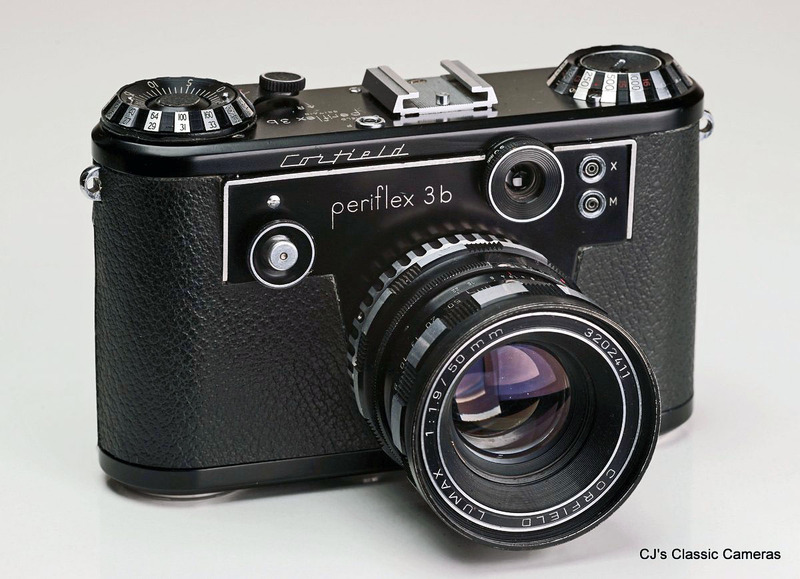 The Periflex 3b was the last Periflex model. 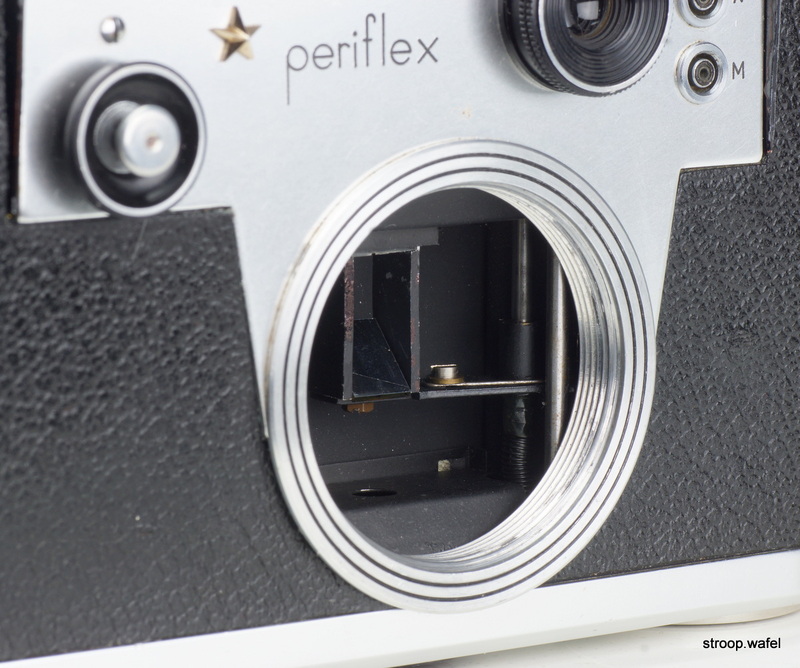 It was a modest update of the Periflex 3a, the main functional difference being the addition of an extra flash contact, although it is unclear to me what type of flash it was for. The most obvious difference was cosmetic, the Periflex 3b was fashioned in black, just like the original Periflex. Clearly, fashion comes in cycles. Corfield Periflex 3b with Lumax 50 mm f/1.9 lens, an updated version of the lens on the Periflex 3 above and the standard lens to come with this model. Top view of the Corfield Periflex 3b. The main difference with the Periflex 3a (other than the colour) was the addition of an flash sync socket on the top, bringing the total to no less than three. 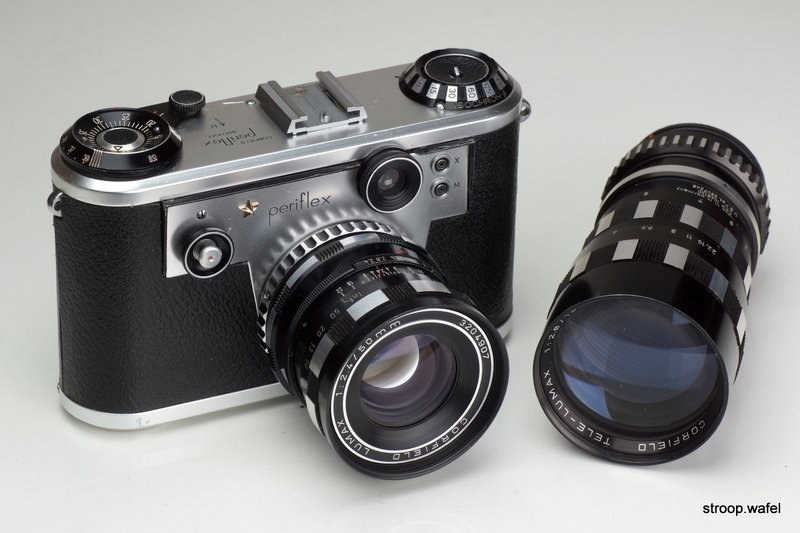 The company's final camera, the Corfield 66, was introduced in 1961 and was quite a change from what it had done before, a medium format SLR camera not dissimilar to the Hasselblad 500C and Fujita 66 also around at the time. 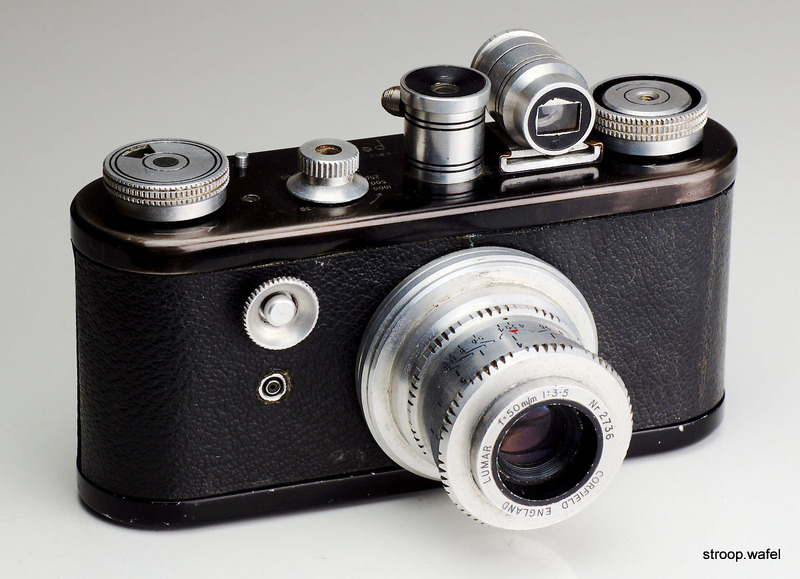 It was a well-constructed camera without any fancy features, presumably in an attempt to keep the price down (e.g., the fold-up leather viewing hood), but it put the money where it was needed. It had an instant return mirror and was flash synchronised although the synchronisation speed was a slowish 1/15s. However, in the early 60s electronic flashes were available that had very short flash times of <1/500s, so the slow synchronisation speed wasn't a real problem. A ring around the focus knob set the flash delay time for various flash types, it is not a manual frame counter as I first thought! 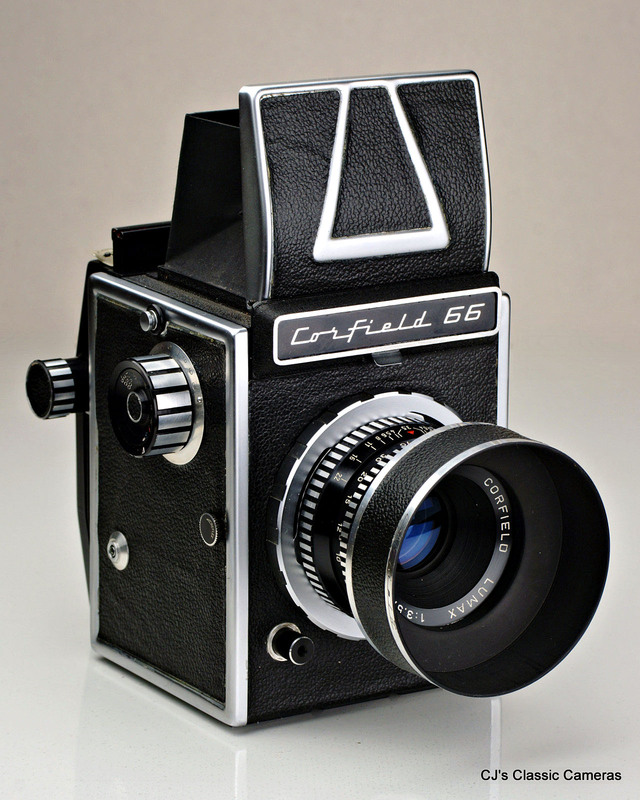 Unfortunately the Corfield 66 is where the story ended; increased competition in the 1960s from Japan led to camera production no longer being profitable although some unfortunate business decisions, including the move to Northern Ireland and a sell-out to Guinness (! ), had also taken their toll. 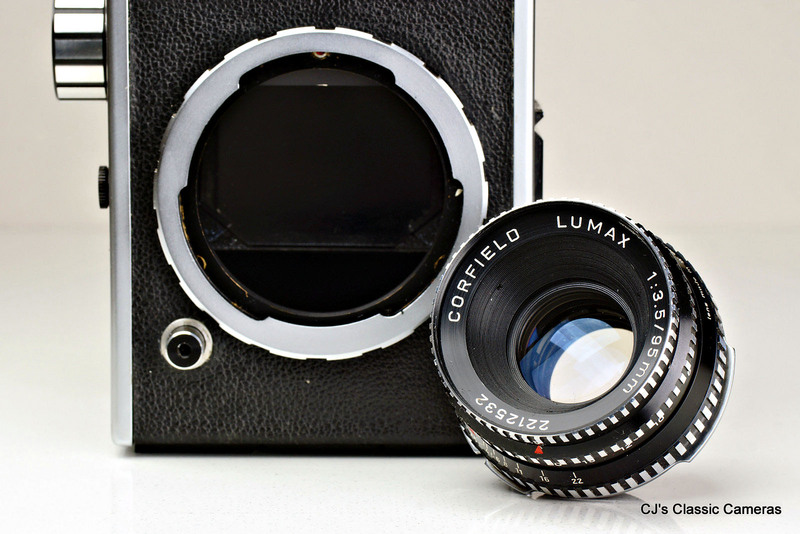 A Corfield 66 with its standard four-element Lumax 95mm f/3.5 lens and dedicated lens hood. This example was in a rather poor state when I got it, with the leather peeling everywhere, shutter very sluggish, lens focus frozen and aperture ring loose, and all light seals perished and spreading disintegrated bits of foam everywhere. The peeling leather is very common on this model, it was attached with double-sided glued paper, which has lost its stickiness over time. Thankfully, due to its construction the camera was fairly straightforward to service and is ready for action once again. 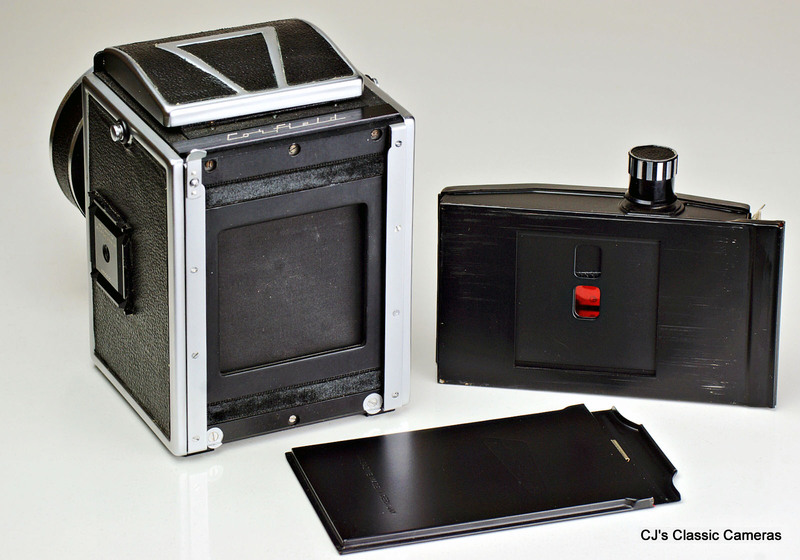 The Corfield 66 could be used with an interchangeable 120 film back (shown here) or with plates for single 6x6 film sheets. Note the fold-up viewing hood of the waist-level viewfinder, made from leather instead of the more usual metal plates. A simple construction, but on this example it does not stay open very well, making framing the shot accurately difficult. 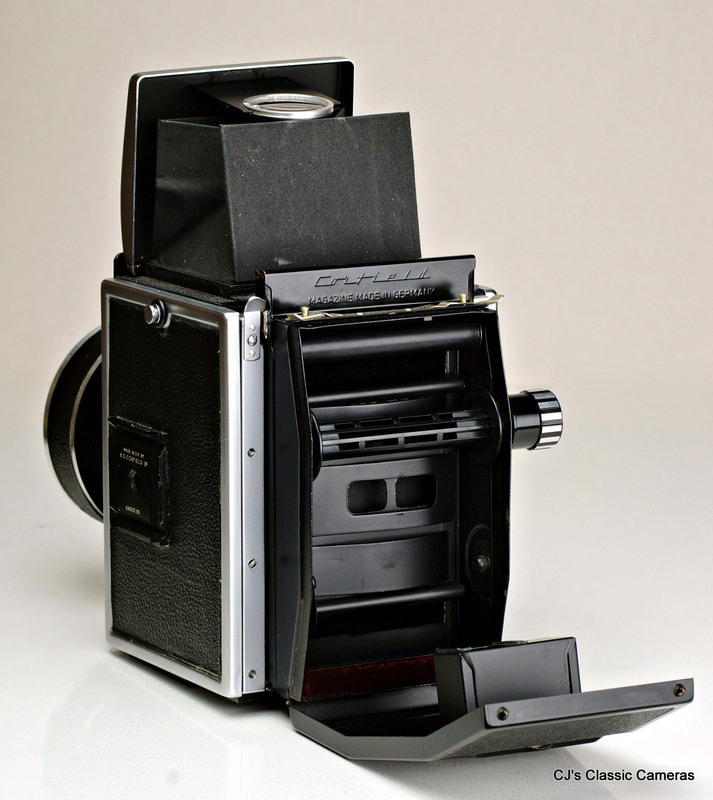 Corfield 66 with the interchangeable back removed, exposing the large focal plane cloth shutter. A blank slide needed to be inserted into the film back to avoid accidental exposure of the film. The film sheet plates produced slightly larger negatives of nearly 60x60mm than the standard 120 roll film size of 56x56mm. 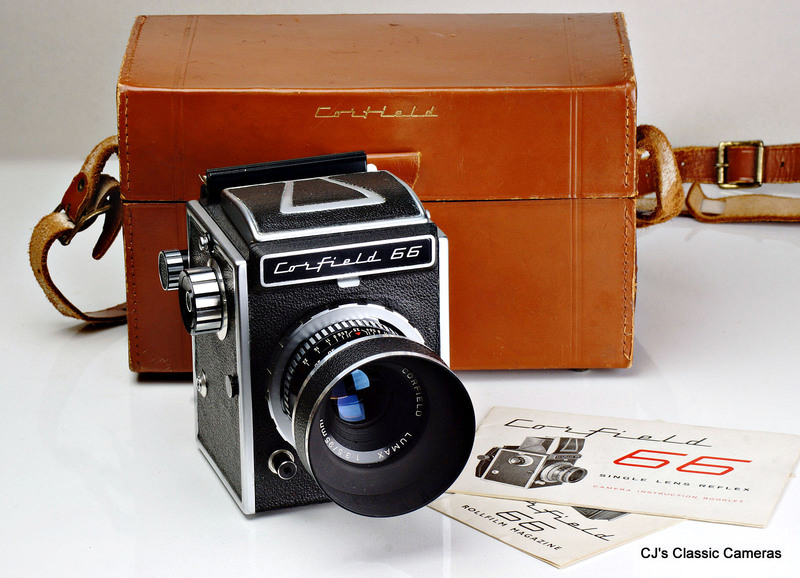 The Corfield 66 came with a large leather case that could also hold a spare film back or a set of single exposure plates. Carrying all this around must have been hard work! To finish, a detail of the Corfield 66 lens mount, which was essentially a breech lock mount, the lens being secured to the camera body by a rotating ring. Like most of Corfield's lenses, the Lumax was made by Enna Werk in Germany. Even though the lens was interchangeable, no other lenses were made for this mount, which is unfortunate, the wide 57mm throat would have been ideal for e.g., a fast portrait lens. Corfield started out as a company by making photographic accessories before they moved into producing cameras. Their first product was an enlarger exposure meter, the Lumimeter, followed by a handheld rangefinder, the Telemeter and an extinction exposure meter. They were well-built and well-finished products, even though they may be perceived cumbersome today. The success of the accessories and the profits that came with it gave Corfield the confidence to branch out into the camera business itself. 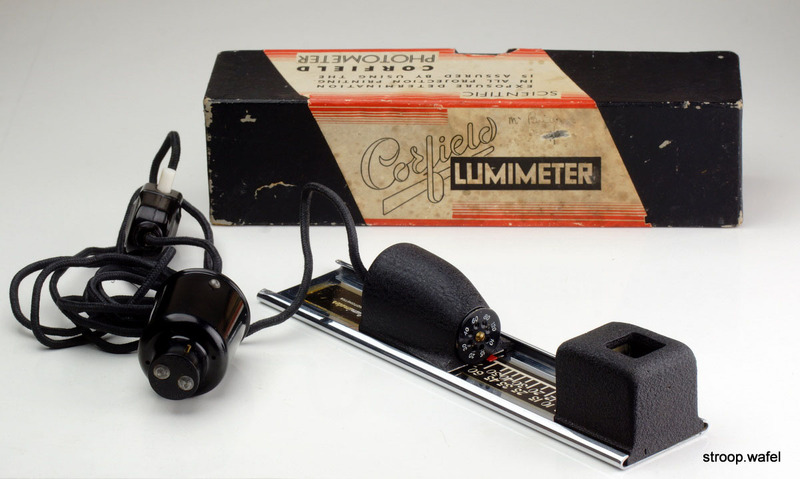 The first Corfield product: the Lumimeter, which went for sale in 1948 and was assembled in the attic of the Corfield family home. 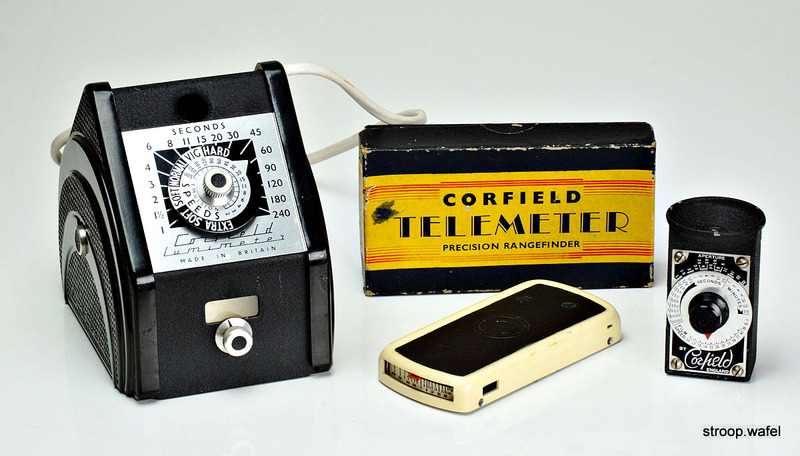 Corfield Lumimeter II, Telemeter (with its box) and Optical Exposure meter.